Rabies, also known as hydrophobia, is one of the world's most terrifying fatal diseases. Death by rabies is physically and psychologically excruciating for the victim. Although any mammal can contract rabies, the disease is extremely rare in small rodents like rats. It is virtually unheard of in pet rats. Rabies is a viral disease that attacks the nervous system. Once infected, the virus remains dormant for several weeks or months and causes no symptoms. This is called the incubation period. Length of incubation period varies greatly in different species but is about two to three weeks in rats. After the incubation period, the virus travels through the nerves to the brain and multiplies rapidly. It spreads throughout the body and causes mental confusion, progressive paralysis, coma and death within a few days. Rabies spreads when the saliva of an infected animal comes into contact with broken skin or mucous membranes of another, usually through a bite. A rabid animal is infectious only after the virus has reached the brain and travels to the salivary glands. Rabies cannot transmit through any other bodily fluids or through the environment. The virus dies quickly outside the body. The Centers for Disease Control reports eleven documented case of rabies transmission between humans through corneal and organ transplants. Although any mammal can contract rabies, certain wild animals species are more likely to have rabies than others. These species are called rabies carriers. Carriers in the United States include raccoon, skunks, foxes and bats. In 2010, there were 6,155 confirmed U.S. rabies cases, mostly in raccoon, bats and skunks. Only 487 were in domestic animals -- mostly cats, dogs and cattle. Two cases were in humans. None were in rats. In the United States, rabies is rare in wild rats and nonexistent in domestic rats. Rabies is thought to be uncommon in rats because rats are so small: They rarely survive a bite from a rabid animal long enough to develop the disease. In 1980, the South Carolina Department of Health documented one case of rabies in a wood rat. No known cases of rats transmitting rabies to humans in the United States exist. However, human rabies caused by rat bites has been documented in Thailand, Poland and Surinam. 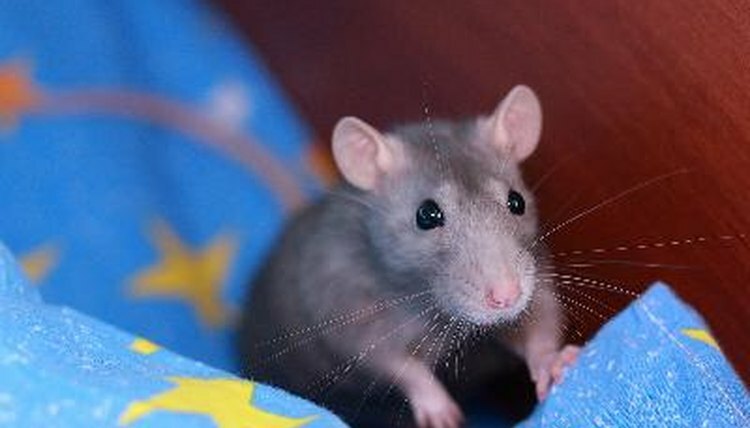 Pet rats kept caged and indoors have no risk of exposure to rabies. Pet rats are not required to be vaccinated against rabies. Centers for Disease Control: Rabies: What Is the Risk to My Pet? Global Alliance for Rabies Control: What Is Rabies?